After the demise of the first Bishop of Vellore, his Vicar General Msgr. 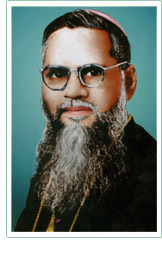 S. David Marianayagam SDB became the Administrator of the Diocese of Vellore from July 1954 onwards. He was appointed Apostolic Administrator of the Diocese of Vellore. This was informed to the councilors on October 14, 1954. On July 05, 1956 he was nominated as the Bishop of Vellore. His consecration took place on the September 09, 1956. The Most Rev. Dr. Louis Mathias SDB, Archbishop of Madras – Mylapore, was the Principal Consecrator Bishop. During the thirteen years of his bishopric, with the motto, ‘Let Jesus and Mary Reign’, he gave his heart and soul to his flock. He gave new look to the Assumption Cathedral; drew up a programme for the social uplift of a widespread nature. Many catechists were appointed to help in the work of evangelization. Besides, he was responsible for the construction of seven churches, 50 chapels, nine presbyteries and seven convents; he renewed and remodeled many churches and institutions; he saw that a sum of money was given to each parish for social work. All this good work shows his zeal for the spreading of Christ’s Kingdom on earth. But on Wednesday, July 16, 1969 at 3.30 p.m. he died of heart failure in the Bishop’s House of Kumbakonam Diocese. The funeral service took place in the Assumption cathedral, Vellore, on Friday, July 18, 1969 at 5.00 p.m.